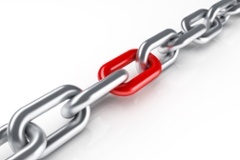 How Strong are the Links in Your Chain of Custody? Many concerns surround the topic of chain of custody in the ITAD process. You can avoid missing ”links” in the “chain” by carefully tracking the equipment internally before your assets reach your ITAD vendor. The more steps you take to track decommissioned assets prior to them leaving your facility, the more traceable and the less risk you will have at the last step in the process, the asset disposition. The moment assets go offline and are decommissioned, they can go missing when they’re placed in the wrong pile, taken and used by another employee, or are moved to another room or building. The things that can go wrong are easily avoidable when you have a good process in place. The time to start tracking assets begins well before your vendor arrives for pickup. Establish a good process for tracking assets that can be implemented once assets are decommissioned. Just marking an asset off in your ITAM system or a spreadsheet is not enough. You should set up ways to track and control assets prior to disposal – sometimes this can be a period of several months. Radio-frequency identification (RFID) tags is a great option. RFIDs are now more affordable than they’ve been in the past, and can be adopted for an added level of traceability across your facilities. For the tightest control at disposition, one of your team members should scan each asset before your vendor comes for pickup, and then the vendor will scan and validate against that list before loading them in the truck. Then, when the items reach the vendor warehouse, have your vendor scan each asset once again at receiving. This adds some extra time and labor to the disposition process, but if you are highly concerned about chain of custody, it could be worth it. Many companies just choose to get a report from their ITAD vendor after the assets are received at the ITAD facility, and they can then validate that against their internal ITAM system and remove the assets from the financial system. It is up to you whether you take all– or none –of these steps, but remember the more measures taken, the more traceable the chain of custody from your hands to your vendors’. When assets are decommissioned, they are immediately at risk of threat. Keep all data-bearing assets secure while you move the assets around and accumulate them for disposition. For additional security, you can have the hard drives erased or destroyed onsite at our facility prior to packing them off to your ITAD vendor. Another option is to put the data-bearing assets in locked crates for shipment. Once loaded into the truck, the doors should be securely locked. By having the assets scanned and tracked throughout the decommissioning and disposition process, you will have a detailed audit trail and the confidence in your internal reporting and financials. Risks involved in not properly tracking chain of custody involve data security risk and environmental compliance risk. Mismanagement of the chain of custody can add cost, but that is often far outweighed by risk. A tighter chain of custody for your hardware assets also enables you to ensure that maintenance contracts and software licenses can be redeployed or canceled, saving far more than the added cost of careful tracking of your hardware assets. And finally, you can minimize risk during, and better manage chain of custody, by selecting a trusted, professional, certified ITAD vendor. Choose a responsive vendor that provides options for asset tracking and reporting that will meet your needs. Contact one of our experienced ITAD professionals to assess your existing process and guide you toward a chain of custody course best suited for your organization based on your current asset management systems and processes, cost, and data security risk.